Do you experience word retrieval problems? Tired easily by a conversation? Have to search for words? Easily put on the wrong track by a word? Sounds familiar. You do not have aphasia? This is possible…. A new study by US researchers shows that spread across the entire brain, areas are activated when we hear several words. Traditionally, only two brain regions were always indicated for the explanation of language areas of the brain, the area of Broca and the area of Wernicke. They are located on the left side of the brains. The new research shows that word meanings are stored scattered throughout our entire brain. This takes place in groups of words that belong together in content. 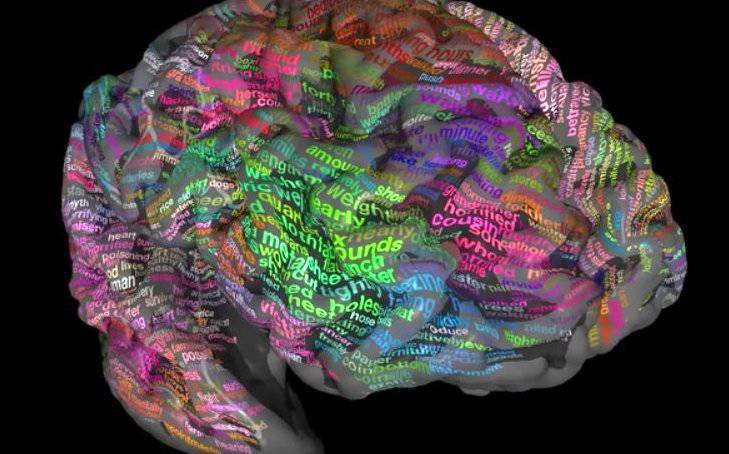 On an interactive 3D brain the locations of many thousands of words are mapped. Researchers created a semantic map of word meanings. During the research the researchers noted that between the participants there was little variation in brain areas that were active when they heard a word. This suggests to them that the congenital anatomic structure determines how word meanings a person has learned are organized in the brain. Learning the mother tongue is done by everyone in a different way. However, the "brain atlases" are strikingly similar. The word meanings are scattered throughout the cerebral cortex and in almost the same extent on both hemispheres. That is, language competence lies not only in the left hemisphere, as for years was assumed by scientists. This explains why people with different kinds of injury can have word retrieval problems. It also explains why people with brain injuries have trouble to understand a word with a double meaning in the context of a sentence. They often grasp language literally, causing a joke eludes them. The word 'top' for example, can be a garment, a mountain peak, or something very good. The brain scans the entire cerebral cortex to find the correct meaning of the word 'top'. Many people with brain injuries consider talking, listening and interpreting the context as tiring. Now we know that this is because the whole cerebral cortex is involved and all interconnections are needed. View the interactieve semantic map of the brain by this link.